Where's the Next Bull Market in Cannabis? Deals in the cannabis space are now coming fast and furious. So much so that I’ve had to budget more daily time to reading dealflow news. The reason is simple: Canada recently legalized recreational cannabis nationwide. It is the first major industrialized nation to do so and, the thinking goes, dominoes will now fall across the world. As such, established weed companies have gone on buying sprees as well as launched full-on blitzes to entrench themselves in as many countries as possible. In May, Aurora Cannabis (TSX: ACB)(OTC: ACBFF) bought MedReleaf for $2.5 billion. And there has been a long list of activities in the space since then. For starters, many of the big Canadian cannabis companies — Canopy Growth (TSX: WEED)(NYSE: CGC), Aphria (TSX: APH)(OTC: APHQF), Aurora — have been fast signing supply deals with individual provinces ahead of the October 17th legalization date. Alberta, for example, plans to buy marijuana from 13 different legal growers to resell in government-run online stores. The province will also sell that product to the private owners of traditional retail stores. Alberta signed deals with Aurora Cannabis for 25,000 kg, Canopy Growth for 15,000 kg, and Maricann Group for 3,375 kg. 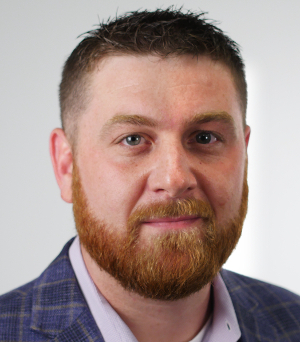 This week, Aurora made a play on cannabis pre-roll technology, buying an exclusive license from CannaRoyalty for C$7 million to use and commercialize a process developed by Wagner Davis. Who’d have thought rolling joints would become such big business? 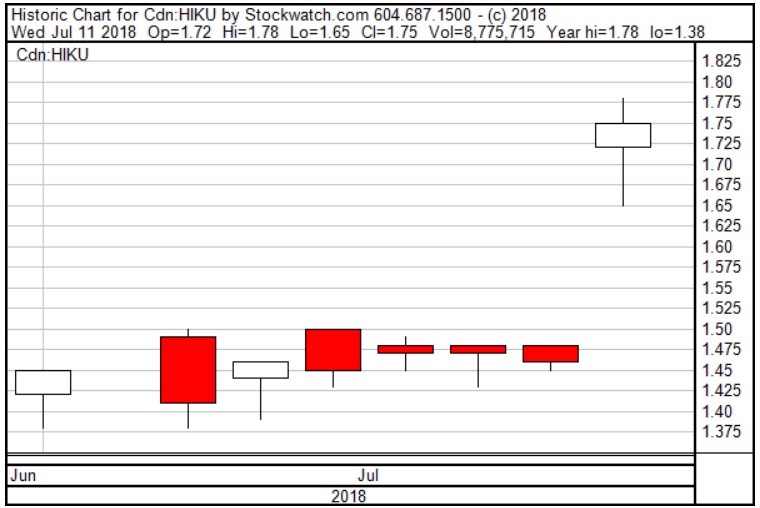 Also this week, Canopy Growth announced it is acquiring Hiku Brands (CSE: HIKU)(OTC: DJACF) at a 33% premium to its recent share price. Hiku comes with a national retail store called Tokyo Smoke, a licensed grow operation, and a female-focused brand called Van der Pop. The deal values Hiku around C$200 million. Nearly a quarter billion dollars… for brands. This is textbook bull market stuff. But don’t call it a bubble… there is still a lot of room to go. Remember… Canada is just the first major nation to legalize. Canopy also bought Spectrum Cannabis Colombia this month for C$45.7 million. It has also formed a subsidiary in the Latin American market called Canopy LATAM Corp.
And the key to profits — as always — is staying ahead of the trends and the herd. Investing in Canadian licensed producers is so 2016. Cannabis royalty companies were last year’s business. First, there will be a rush on companies listing in Canada that operate in states in the U.S. where weed is legal. Mark my words, the U.S. is headed toward nationwide legalization. New York recently said it will stop arresting people for it (again, dominoes falling). If you can get invested in companies listed in Canada that operate in the U.S. long before that legalization occurs, I think you’ll be much better off. Second, and perhaps bigger, is medical cannabis. We’ve only seen the tip of the iceberg when it comes to what medicinal marijuana can do. As I told you a few weeks ago, the U.S. Food and Drug Administration just approved a marijuana-derived drug for the first time ever. The drug is for seizures. 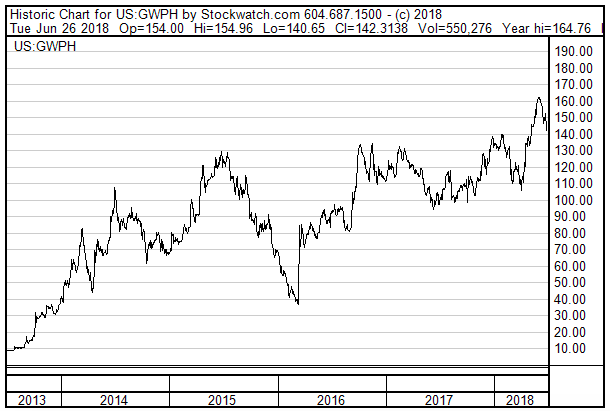 And GW Pharma (NASDAQ: GWPH), the company that developed the drug, has gone up 1,550%. We think cancer is one of the next major diseases to be disrupted by cannabis. One tiny company has found a way to make cannabis destroy breast cancer cells with laser-like precision. By checking out our brand-new research here.